Various news organizations are suggesting that President Trump will have a hard time selling the new United States–Mexico–Canada Agreement (USMCA) intended to supersede the North American Free Trade Agreement (NAFTA), which he ceremonially signed at the Buenos Aires G-20 summit despite opposition from Democrats and several unions. For instance, Nancy Pelosi, House Democratic leader — and likely speaker again, once the post-midterms House is seated — joined with unions in decrying the absence in USMCA of provisions on the environment and working conditions and wages relating to the Mexican sector of the agreement, saying these would undercut U.S. workers. My first reaction to all that was wry amusement. This is the same Nancy Pelosi and the same Democratic party, and these are the same unions, that welcome aliens living and working illegally in the United States without reservation, and that fight so hard to preserve a broken border security system. It would appear that they have no problem undercutting U.S. workers on the home front — it's only when potential illegal crossers choose to stay at home and work if given new opportunities that Pelosi, the Democrats, and the unions appear to have a problem. Could this be because they accrue no power base, no influence, and no contributions or dues from Mexicans who don't join the millions who have already entered and work without authorization? My second reaction was one of puzzlement: The Constitution specifies that advice and consent on treaties is the work of the Senate, not the House, and the Senate remains in Republican hands. So how could the new House Democratic majority threaten USMCA? A quick dig tells me that there are different kinds of international agreements, only one of which is understood in U.S. law as a treaty requiring senatorial advice and consent. There are also multilateral agreements short of treaties, which require a simple majority of votes in each chamber of Congress to become effective. That is the group into which the USMCA falls, and therein lies the problem for the president: Either garner a quick vote before the composition of the existing Republican majority in the House changes, or find a way to persuade enough House Democrats to cross the aisle to vote for the new pact later. 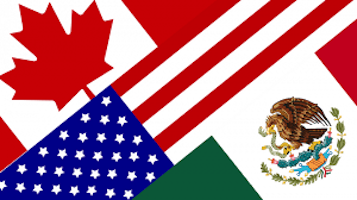 Note that this blog isn't intended to be an exhaustive review of USMCA; it is a quick take, and nothing more. This portion of USMCA governs how the respective governments will provide for the admission of temporary entrants under the agreement, although "temporary" is defined loosely as being "without the intent to establish permanent residence". One might, then, presumably reside in the United States for an extended period of time, as long as the requisite "intent" of acquiring permanent resident alien status is lacking. I find myself wondering why an alien entering under a USMCA visa would care about permanent resident alien status under such ill-defined circumstances. It becomes an irrelevancy. The scope provisions say that the chapter "does not apply to measures affecting natural persons [humans, not corporate entities] seeking access to the employment market of another Party", apparently in deference to each country's normal immigration processes, but immediately go on to say "provided that those measures are not applied in a manner as to nullify or impair the benefits accruing to any Party under this Chapter". Which, then, holds precedence in areas of conflict? The preexisting immigration laws, or the USMCA? The answer is complicated, and involves both Chapters 29 and 31, discussed below. Another potential area of conflict is that, notwithstanding the language asserting that Chapter 16 doesn't apply to measures affecting persons "seeking access to the employment market" of another signatory country, the chapter specifically provides that the usual requirements of such things as labor certifications don't apply. Where does one draw the line? One might think that, because this is an agreement designed to further the free and fair exchange of goods across the three nations' borders, only persons whose entry facilitates that process would be subsumed under the rubric of the USMCA. Not so. For instance, translators and interpreters are specifically mentioned as meriting admission as "temporary" entrants. Given that the primary languages of the three nations are English, French, and Spanish — all of which are commonly enough spoken throughout the United States, Canada, and Mexico — it is difficult to imagine why they are in such short supply as to merit coverage. But they aren't the only ones. Appendix 2 of Chapter 16 enumerates those natural persons who are equally entitled to seek temporary admission. It is a wide-ranging list and includes foresters, hotel managers, computer systems analysts, librarians, social workers, teachers, and lawyers. To pick one example: Why, one wonders, might a high school teacher seek entry to work at a U.S. school under an agreement designed to facilitate trade and the movement of goods? How about librarians and social workers? Are they truly in such short supply? If so, isn't that why the labor certification process exists? Why add them to this agreement? Similarly, while one might see a reasoned explanation for permitting lawyers of one nation to enter into the other to help perfect a deal being negotiated between two cross-border business firms, Chapter 16 doesn't limit the reach to such situations. Do we really need more lawyers practicing in the United States? Google "too many lawyers in U.S." and find the responses, even from among those in the legal profession, then draw your own conclusion. In reviewing the extensive list of "professionals", one is reminded of NAFTA, which under the auspices of the "TN" visa, permitted an unlimited number of individuals to enter and work in the United States in occupations that seemed to have little actual relevance to fostering free trade (see here and here, for examples). Whether, and how far, to open the door to unfettered access by foreign professionals to these occupations in the United States will depend in no small measure on a Temporary Entry Working Group that is established by Chapter 16, which specifies that the working group must "includ[e] representatives of immigration authorities" of the signatory nations. By implication, though, this also means that the working group will also include other-than-immigration authorities to weigh in on matters of which they may have little or no expertise. Among the specific items that the working group is charged with is this interesting item: "the waiving of labor certification tests or procedures of similar effect for spouses of business persons who have been granted temporary entry for more than one year." By implication, it's clear that the agreement contemplates many "temporary" entrants whose duration of stay will exceed a year, and also that the drafters of the document are already looking ahead so far as to figure out how to permit the spouses (and conceivably other dependents) of such entrants to work in one another's countries. It is not precisely that there is anything overtly in conflict with existing U.S. immigration laws in this chapter of the agreement. There are, in fact, many important and desirable provisions in Chapter 23 relating to prohibitions against forced labor, child labor, or undercutting of labor laws and negotiated agreements, all of which are important corollaries to enforcement of the immigration laws, not just against aliens working illegally, but against abusive employers. My concern is in the language of Article 23.8, Migrant Workers: "The Parties recognize the vulnerability of migrant workers with respect to labor protections. Accordingly, in implementing Article 23.3 (Labor Rights), each Party shall ensure that migrant workers are protected under its labor laws, whether they are nationals or non-nationals of the Party." I am almost certain that this language was inserted at the insistence of Mexico, and it is significant that the language does not specify between lawful and unlawful workers. I don't suggest that illegal aliens should not be protected from labor abuse — they undoubtedly should — but what constitutes "labor protections"? It is the deliberate obfuscation of the exact scope and intent of this article that I find troubling. The bland title obscures the importance of this provision, because, under the "Administration" related portions, it addresses how denials of temporary entrants will be handled. Superficially, it simply speaks to the need for judicial, quasi-judicial, or administrative tribunal proceedings that are fundamentally fair and give the individuals an opportunity to be heard and present evidence. This generally accords with the way the immigration laws of the United States already work. "[I]ssue interpretations of the provisions of this Agreement", which interpretations are described in a footnote as "binding for tribunals and panels established under Chapter 14 (Investment) and Chapter 31 (Dispute Settlement)". Insofar as Chapter 31 may be invoked in immigration cases that any signatory party suggests have implications beyond a single individual, it is clear, then, that both dispute settlement panels and the Commission have the potential to render rulings that may run counter to existing provisions of U.S. immigration law. The dispute and mediation mechanisms governed by Chapter 31 are authorized in immigration matters by Chapter 16, which provides that upon denial of entry to a "business person", the country must also notify the other "party" (nation) from which that business person emanated. It then goes on to define "dispute settlement" procedures relating to how to deal with entry denials as covered by Chapter 31, Dispute Settlement, and specifies that those procedures kick in when all administrative appeals have been exhausted. The dispute is then carried to a panel for consideration and resolution. The remedies referred to in paragraph (1)(b) will be deemed to be exhausted if a final determination in the matter has not been issued by the competent authority within one year of the institution of an administrative proceeding, and the failure to issue a determination is not attributable to delay caused by the business person. I cannot speak for Canada or Mexico, but in the United States, it would be extremely rare for all administrative appellate avenues to have been exhausted before a year plays out. It is obvious from the phrasing, then, that the chapters highlighted in bold are intended to impose immigration obligations on the signatories, and they are, of course, the relevant chapters of the accord. However, the problem, if indeed it proves to be a problem, is that any signatory nation may raise a case to the level of dispute resolution based on its own perception of whether or not the case has repercussions beyond the single denied entrant, and/or its own perception of what constitutes a "pattern or practice" (which might indeed be the fact of the matter, if the case is being adjudicated according to statutory law, and likely all similar cases would be decided the same way because of the statute). This raises the question of how often dispute settlement resolutions may be invoked to obtain results contrary to the provisions of the Immigration and Nationality Act. At this juncture, we don't know. Establishes a sunset provision of 16 years from the date that it comes into force, with an additional proviso that it may be extended in 16-year increments on agreement of the parties. There are a number of items in the USMCA that suggest, as has been suggested about NAFTA, that it will inevitably result in a surrender of a certain amount of sovereignty where administration of the immigration laws are concerned. Exactly how much remains to be seen. And one must ask as a counterbalance whether the agreement will so sufficiently result in expanded job opportunities for Mexican nationals, in Mexico, so as to ameliorate at least some of the illegal cross-border traffic that we have seen for so many decades. It is not clear that it will. Many studies have been conducted showing that a substantial portion of the illegal population in the United States, Mexican or otherwise, consists of unskilled or, at best, semi-skilled laborers of minimal education. Will they accrue the benefits of this new agreement? They didn't under NAFTA. In sum, the jury is still out.